Gisteren was de laatste bijeenkomst van de cursus houtbewerking voor het woensdagklasje en dat betekende natuurlijk dat het tijd was voor een bespreking van de laatste fase van een houtbewerkingsklus: de assemblage en de afwerking. Cursisten hebben onder meer geleerd waar ze op moeten letten bij het in elkaar zetten van een stuk en hoe ze hun stuk uiteindelijk moeten behandelen. Met hun eigen projectjes waren de cursisten weliswaar nog niet zo ver – zie de foto’s – maar dat was ook niet per se het doel. Tijdens de cursus hebben de cursisten in ieder geval basiskennis en -vaardigheden verworven waarmee ze nu thuis hun projectje kunnen afmaken en hopelijk nog vele andere creatieve klusjes zullen realiseren. Wil jij ook kennis opdoen over hout en houtbewerking en leren werken met traditionele tools en technieken? Meld je aan voor de cursus! Voor meer informatie klik hier. We are happy to announce that we have just added a new piece to our portfolio. 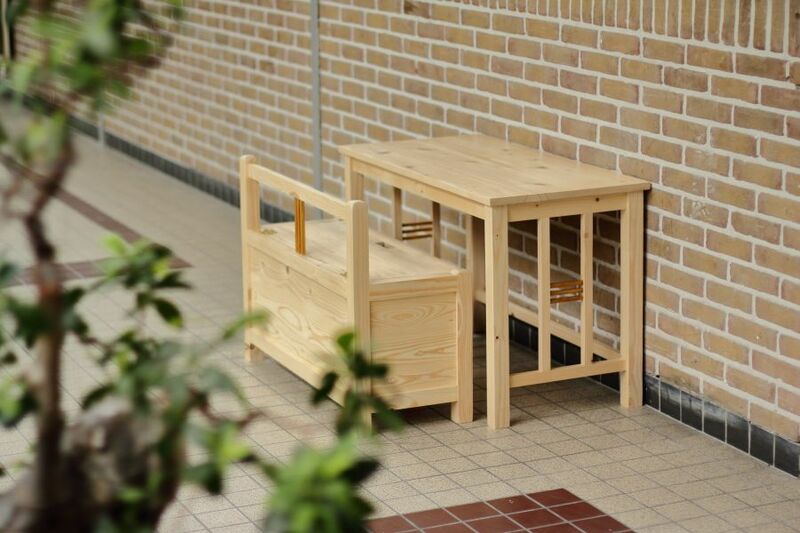 Laurier is a children’s desk and bench combination made for a client as part of our bespoke service. It was named after the client’s son, for whom the desk and bench are meant. For more photos and information, visit Laurier’s product page in our online shop. 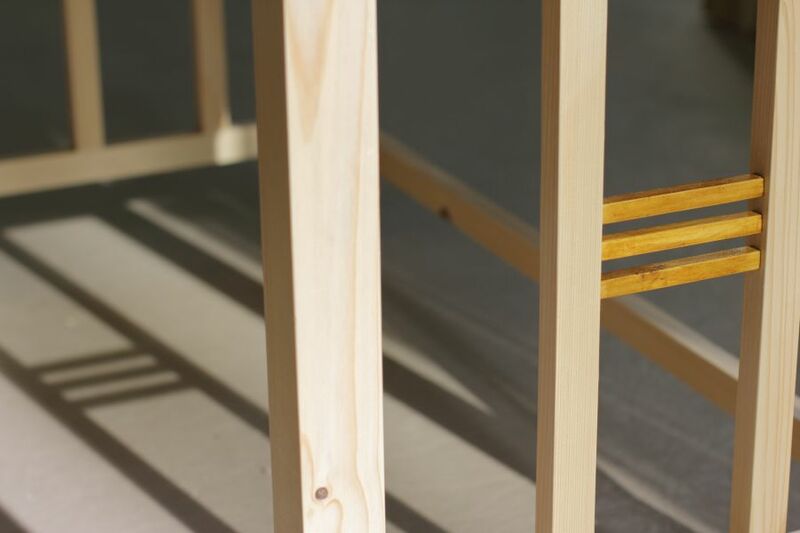 Detail of our latest piece, a bespoke child’s desk and bench combination fully made out of reclaimed wood. More photos and information will follow soon. Look what we received in mail yesterday! Yesterday it was the Thursday class’ turn to learn the basics of sawing, planing, and chiseling, and making their first mortise and tenon joint. Just like Wednesday’s participants, they experienced some beginner’s difficulties, like struggling to saw in a straight line or carving out a clean mortise, but in the end did manage to make a mortise and tenon joint! We may even say that some of Thursday’s participants produced even better joints than Wednesday’s participants. Kudos for that! This week the focus was on getting the skills right and since the participants worked on a piece of scrapwood, they could permit themselves to make errors. Next week they will pick up the work on their pieces and put the newly learned skills to use. This time, there will be no tolerance for errors however; they need to get their work right. Are they up for this challenge? Stay tuned to find out! Chiseling out a place for a hinge in what is to become the kitchen cabinet door for the fridge in our atelier. 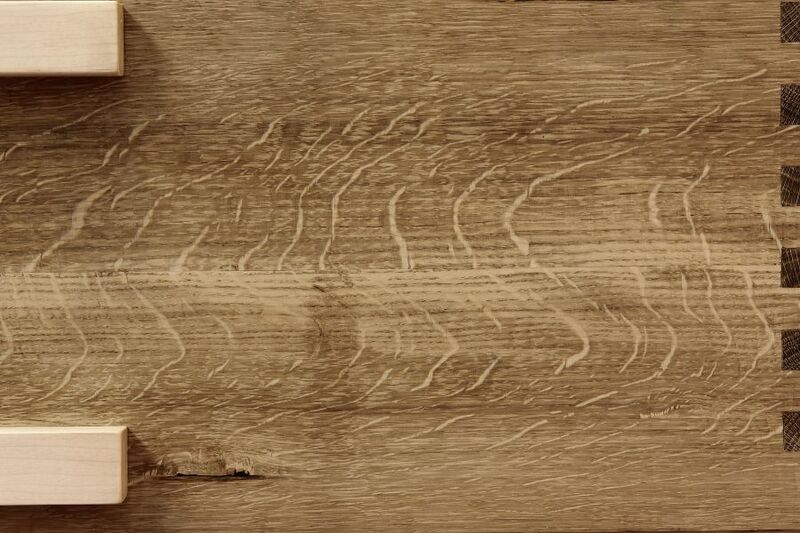 The curious tiger pattern meandering along the oak case of our cabinet Vlekken is known as ray flakes. Rays are cells that are positioned perpendicular to the tree’s growth direction and serve as channels for nutrients and water between the inner and outer layers of the tree. We have just had the first session of our artisan woodworking course for beginners. During this session course participants learned how to measure and mark the wood and were introduced to the world of traditional wood joinery. In the followings sessions they will learn to cut some of these joints by hand for their own projects. At Espenaer’s woodworking courses we do not follow a fixed and meticulously outlined program, but rather a flexible and broad trajectory in which course participants can choose their own woodworking project and learn the trade at their own pace. Would you like to do a woodworking course too? Click here and register now for our July class!